Thirteen stories revolve around an ordinary coastal Maine woman and her harsh, yet painfully honest views on life, love, aging family, struggling with insecurities...there is a small sense of humor and hope throughout. Great discussion book. A Pulitzer Prize winner. In a voice more powerful and compassionate than ever before, New York Times bestselling author Elizabeth Strout binds together thirteen rich, luminous narratives into a book with the heft of a novel, through the presence of one larger-than-life, unforgettable character: Olive Kitteridge. At the edge of the continent, Crosby, Maine, may seem like nowhere, but seen through this brilliant writer’s eyes, it’s in essence the whole world, and the lives that are lived there are filled with all of the grand human drama–desire, despair, jealousy, hope, and love. At times stern, at other times patient, at times perceptive, at other times in sad denial, Olive Kitteridge, a retired schoolteacher, deplores the changes in her little town and in the world at large, but she doesn’t always recognize the changes in those around her: a lounge musician haunted by a past romance: a former student who has lost the will to live: Olive’s own adult child, who feels tyrannized by her irrational sensitivities; and Henry, who finds his loyalty to his marriage both a blessing and a curse. As the townspeople grapple with their problems, mild and dire, Olive is brought to a deeper understanding of herself and her life–sometimes painfully, but always with ruthless honesty. 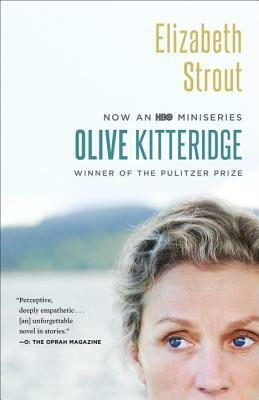 Olive Kitteridge offers profound insights into the human condition–its conflicts, its tragedies and joys, and the endurance it requires. Elizabeth Strout is the Pulitzer Prize–winning author of Olive Kitteridge, as well as The Burgess Boys, a New York Times bestseller; Abide with Me, a national bestseller; and Amy and Isabelle, which won the Los Angeles Times Art Seidenbaum Award for First Fiction and the Chicago Tribune Heartland Prize. She has also been a finalist for the PEN/Faulkner Award and the Orange Prize in England. Her short stories have been published in a number of magazines, including The New Yorker and O: The Oprah Magazine. Elizabeth Strout lives in New York City. RJ Julia's 10th Annual Poetry Contest and Slam!